History: The mural painting was commissioned by the influential Sforza family. Leonardo da Vinci started the project in 1495 and completed it in 1498. The Last Supper is a mural by Leonardo da Vinci in the refectory of a Milan church. It depicts the biblical moment when Jesus revealed to his twelve disciples that one of them would betray him. Leonardo's interpretation of how each apostle would react to the announcement forms the basis of this painting. Through the depicted reactions, one can learn about each of the apostles. The famous Renaissance painter spent three years working on the mural. Due to environmental degradation, the painting today is far from what it was in da Vinci's time. Fortunately, there are at least two full-scale copies of The Last Supper (oil on canvas) made by Leonardo's contemporaries that remain in good quality. The one featured in this critique is by Andrea Solari (1520). In term of technique, this painting is not any more special than the hundreds of great murals about the last supper. What really stands out from the painting is Leonardo's genius interpretation of the biblical moment. The unique poses showcase the intricacies of the twelve apostles. For example, the figure-raising angry disciple is Saint Thomas who ironically briefly doubted Jesus' resurrection. Leonardo's depiction of Judas is the most intriguing. 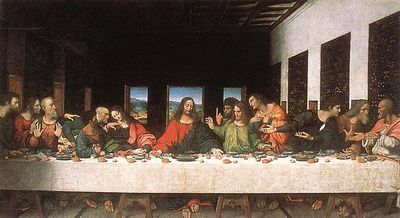 In other Last Supper paintings of the same period, either Judas is cast away from Jesus and other disciples or everyone except Judas is given a halo to help viewers identify him. In Leonardo's painting, Judas is among the apostles and is placed close to Peter and John, Jesus' two most important disciples. He is clutching a small bag of what is presumed to be money, signifying either his status as the group's treasurer or the payment he received for betraying Jesus. He appears to be caught off guard by the announcement. Note how Jesus' right hand is stretching toward Judas' left hand, indicating the identity of his betrayer.